St Patrick’s Anglican Primary School. The initiative’s major sponsors include the Sandals Foundation, Scotiabank Community Programme, Horizon Yacht Charters, McIntyre Bros. Ltd. and US-based family foundations and individual Hands donors. In addition, Hands Across the Sea supplied brand new, targeted reading books for school libraries at Grenada Christian Academy, Happy Hill Secondary School, Harvey Vale Government School, St David’s RC Primary School, St Joseph’s Catholic Primary School, and St Mary’s RC Primary School. Hands has also provided Remedial Reading Toolkits and remedial reading workshops to 5 Grenada secondary schools: Grenada Christian Academy, JW Fletcher Catholic Secondary School, St David’s Catholic Secondary School, St Mark’s Secondary School, and Westerhall Secondary School. “Hands Across the Sea wishes to thank our valued partners in child literacy – the individual and corporate donors who funded new books and supported the work of our Hands Literacy Links, and the companies who rebuilt library spaces to help turn them into vibrant centres of discovery and learning,” said Harriet Linskey, Co-Founder of the organisation. “We also want to commend the efforts of Gloria Bonaparte and Bernadette John, our two Hands Literacy Links for Grenada. 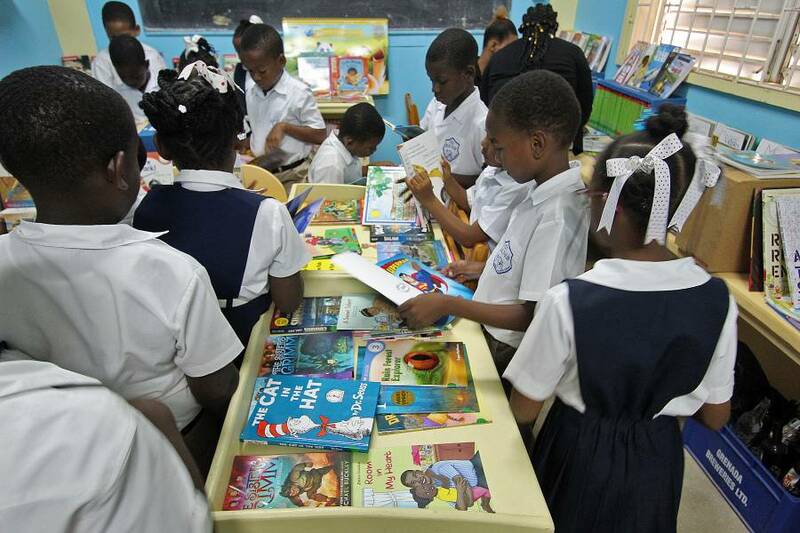 The tireless support of school staff by these programme officers has resulted in more children than ever becoming engaged with books, reading, and their school library.” To date, Grenada’s Hands Literacy Links have trained over 400 children as Student Librarians. Primary schools in Grenada have also received Hands Across the Seas groundbreaking 179-page Teachers Resource Guide to the Library (Grades K-3), the just-revised Hands Library Manual for Primary Schools, and the updated Hands Student Librarian Handbook. All resources are free and downloadable from the Hands website (see links below). Since the organisation’s founding in 2007, Hands Across the Sea has assisted 72 primary and secondary schools and reading programmes in Grenada, sent 57,000 asked-for books, and given 20,580 Grenadian children access to top-quality, appropriate books and literacy support materials. The organisation works in Antigua, Dominica, St Kitts and Nevis, St Lucia, St Vincent and the Grenadines, and Grenada. To date, Hands Across the Sea has served 352 schools with over 464,000 books, reaching 103,700 children. Wow! Great news and a big THANK YOU to Hands Across the Sea for your thoughtful generosity. In my days (the 50s & 60s) there was only one library in the entire parish of St. George, not specific to the school; it was for every man, woman and child. Hi students please make very good and plentiful use of those books, take care of them,( no doggy ears) so they can be passed on to your junior students in perfect condition, Keep reading! And reduce the use of your cell phone?